Mary, Queen of Scots, the tragic would-be royal of England and Scotland, is a figure whose story has been told many times over in several different formats, from film to television to literature to the stage and so forth, and is told once more in this grandiose historical drama from director Josie Rourke. Upon Rourke, and by extension writer Beau Willimon, lies a challenge; find a way to make this oft-told story feel fresh and exciting again, especially at a time when industry attitudes towards women are changing for the better, and when audiences are clamouring for more female-driven stories to be told on the big screen. Rourke’s film certainly has a lot on its mind when it comes to female representation in this particular time period, and the filmmakers have definitely put their best efforts towards showing the many downsides of it, but overall the film doesn’t take enough chances for it to truly stand out as the definitive biopic on the fallen ruler. It starts in 1561, when the Protestant Queen Elizabeth I (Margot Robbie) resides over England, but when Mary Stuart (Saoirse Ronan) returns from exile in France to take her place on the Scottish throne, things are thrown for a loop. Mary is young, beautiful, Catholic, and able to produce an heir to the throne, whilst Elizabeth is yet to marry or even become pregnant, which only further solidifies Mary’s claim to power. On both sides, there is fierce opposition to Mary’s ambitions; Elizabeth’s advisors are firmly against a Catholic queen presiding over a Protestant country, while many of Mary’s closest cabinet members are outraged at the mere fact that they are serving a woman, leading to a game of chess between both monarchs which, if you know your history, isn’t going to end well for at least one of them. At least, if you probably know your history better than this script, which is filled with inaccuracies and over-simplified details that don’t exactly make this a particularly reliable source. Now, I am well aware that for most films depicting historical events and figures, there has to be some amount of liberties taken to spice up the drama and make it more accessible to audiences; however, there’s a difference between making changes to the story so that audiences can enjoy it, and rewriting history altogether. Obviously, this film doesn’t go full Inglourious Basterds and have Mary kill Elizabeth at the end or anything, but there are a number of glaring errors in this depiction that make it feel a lot more unreliable than some other historical movies like this; for example, it’s been long disputed about whether there was an actual meeting between Mary and Elizabeth, as seen in the trailer and in the film proper serves as its climax, but this film is going along with the theory that not only did it happen, but that there was a brief understanding between both women before making their intentions known, whereas in reality both women were rivals from the start and did not make such a meeting. In addition, it’s already been confirmed by historians that Mary Stuart, who was raised in France, would not have a primary Scottish accent as she does in the film, and largely spoke and wrote in her adoptive native French; again, it’s easy to see why they allowed it for this film (after all, for those unfamiliar with the story, it would be almost impossible to buy a French-speaking woman as a potential ruler of Scotland) but it sacrifices true historical prominence for the sake of artistic license, and is bound to annoy historians of the Elizabethan era to no end. These problems wouldn’t necessarily be problems if the film was more entertaining and exciting, which it really isn’t; although the film boasts strong production values, and benefits from two great actresses in the lead roles – Saoirse Ronan has yet to disappoint, while Margot Robbie makes for a compelling portrayal of the Virgin Queen – there is not a whole lot to this film that worth getting too excited over. The most interesting thing about it, other than its glaring historical inaccuracies, is how it highlights the sexist ideals of the men serving underneath their respective Queens as a major contributor to Mary’s eventual fall from grace; the men in Mary’s court, especially ones such as David Tennant’s influential Protestant cleric John Knox, cannot seem to let go the fact that their new ruler is female, and one could argue that Mary as depicted in this film serves as a mere parallel to female figures of the modern era who are easily outdone by seething male counterparts, a topic that is certainly ripe for tasting in this day and age. Unfortunately, the film doesn’t do much else to set itself apart, and the end result – ambitious though it may be, both in front of and behind the camera – comes across as disappointingly bland, a noble failure in an attempt to become a definitive movie about the subject, which just doesn’t quite come together as much as the filmmakers want it to. It is a movie that just goes in one ear and out the other, and come the middle of the year most people will have likely forgotten that it even exists, let alone made a small but significant awards push. I can see it picking up a Costume nod, and at a stretch maybe a nomination for Robbie, but other than that this isn’t the awards contender most people would have liked it to be. 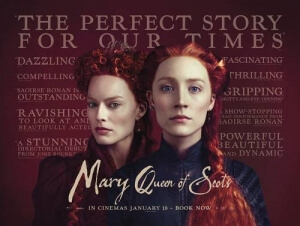 It’s a shame to see a movie like this kind of fall back on itself, but perhaps like Mary, Queen of Scots herself, this is perhaps a little too ambitious for its own good. Mary Queen of Scots is a noble but ultimately unmemorable look at the life of the tragic would-be monarch, with glaring historical inaccuracies and a lacking entertainment factor preventing it from being a new historical classic.